The Dolezal Family: Turning 2! Sunday evening we had a party for Aiden's 2nd birthday. Our guests were: Grandma & Grandpa Prewit, Grandma & Grandpa Little, Great Grandma Keith, Jim & Jan Sipes, and Todd & Kari Wallentine. 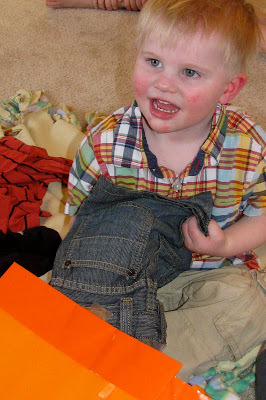 He was given lots of great gifts and really got into unwrapping and putting on a little show. He was acting like quite the goof ball. 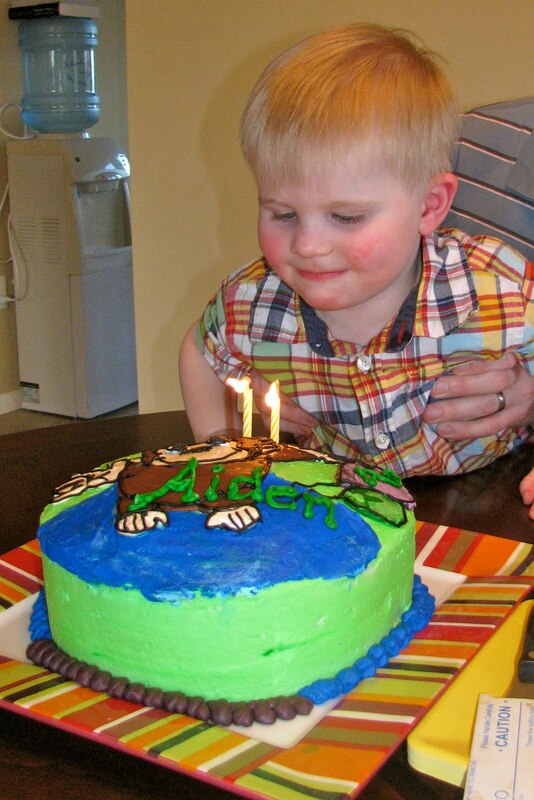 His monkey cake -- It didn't turn out exactly how I pictured it but still cute. Some of his clothes he got, doesn't he look like he is looking at Jan and saying "Thanks for the shorts." 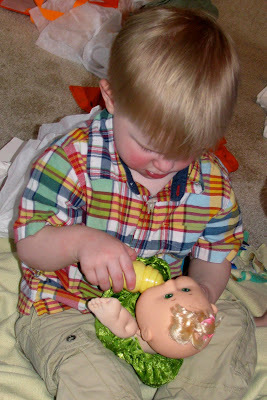 We got him a Cabbage Patch Newborn. They don't tell you what it is on the box, its a "surprise". He got a baby girl named Lennie Grace. We'll find out in a couple weeks if our newborn will be twins with his newborn. Chocolate ice cream dropped on his pants, he's apparently did not want to waste a drop! If you think he is throwing a tantrum here, he is not. KoolAid spilled on the table and dripped on the floor, Aiden was sucking it up for us. He really was acting like a goof ball that day. We gave a Doll to Damon too, and that just produced two more boys. We are Lehi to your Ishmael. :) Can you say 4 boys. Thanks for the approval on the NEW RIDE. Maybe by Father's day I can get my sub-woofer and play ICE ICE BABY by your house.